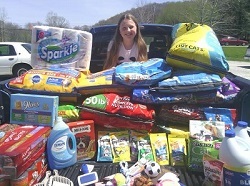 Thank you for your interest in helping the animals of the Brown County Humane Society. Due to space limitations, you must be at least 15 years old to volunteer AT the shelter. However, there are many ways in which you can still volunteer and help the animals, and we always welcome you to visit the shelter any time we’re open. Below is a list of ideas for your volunteer time or school project, or you can create your own project. Here are some ideas of ideas of things you can make for the animals. Or, do some research online and find ideas of your own. Just be sure that whatever you make is safe for animals. Homemade dog treats, cat toys, pet beds, and outdoor shelters are always helpful and fun for the cats and dogs. Have a yard sale, dog wash, bake sale or other event and donate the money you raise to support the animals. Collect donations of cat/dog food or items from our wish list. Challenge the other classes in your school to see who can raise the most money in a certain time. Make toys and treats and sell them to raise money for the animals. 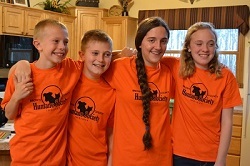 Give a presentation to your class, your scout troop, your church, or other group about the shelter or animal adoption. 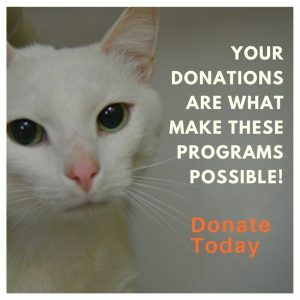 Whatever you choose to do, you will be making a difference for homeless animals.